Last Updated: 20.01.19 By Adrian B. Hey ninjas, what are you guys working on? Interested in the DeWalt DCF887 screw gun? Do you want to know a little bit more about it? Well … I’ve put together this DeWalt DCF887 Brushless Impact Driver Review article for you which I’m sure that by the time you finish reading it … you’ll know if you love or hate this impact drill! A FANTASTIC impact drill for a professional like yourself. It’s fully packed with great features. It’s powerful which means you’ll be able to drive even the most stubborn screw, no matter what 🙂 Small, powerful, light … it’s exactly what you need as a PRO!!! And to answer the question from the top picture … I for one, I love it, and I do consider this tool to be a good investment for both, PRO or a DIY enthusiast. The impact driver is among the most popular cordless tools today. To most professionals, it is the number one tool for driving screws and other fastening tasks. When it comes to brushless impact drivers and power tools in general, DeWalt is and has been the go-to brand for years now. The DeWalt DCF887 is a masterpiece of engineering and packs some serious features definitely worth checking out. 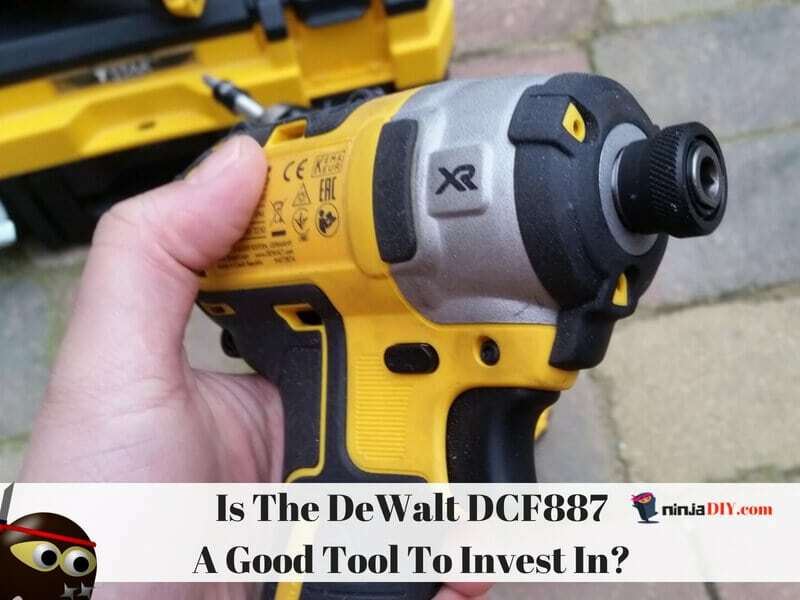 In this DeWalt DCF887 review article, we will have a look at what makes the DCF887 one of the best impact drills on the market. 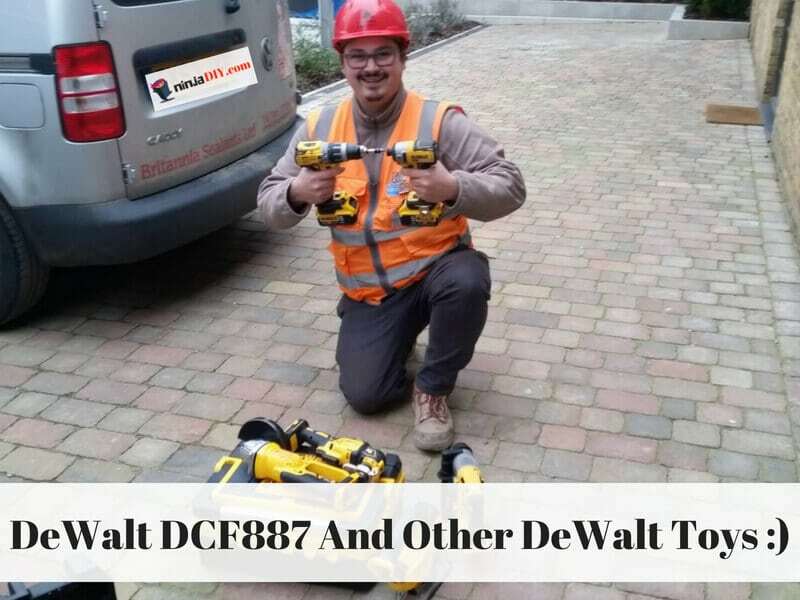 You might see in the pictures that I have a DeWalt set of power tools … this is not a DeWalt DCF887 Combo/Kit … today, we are talking only about the tool itself. 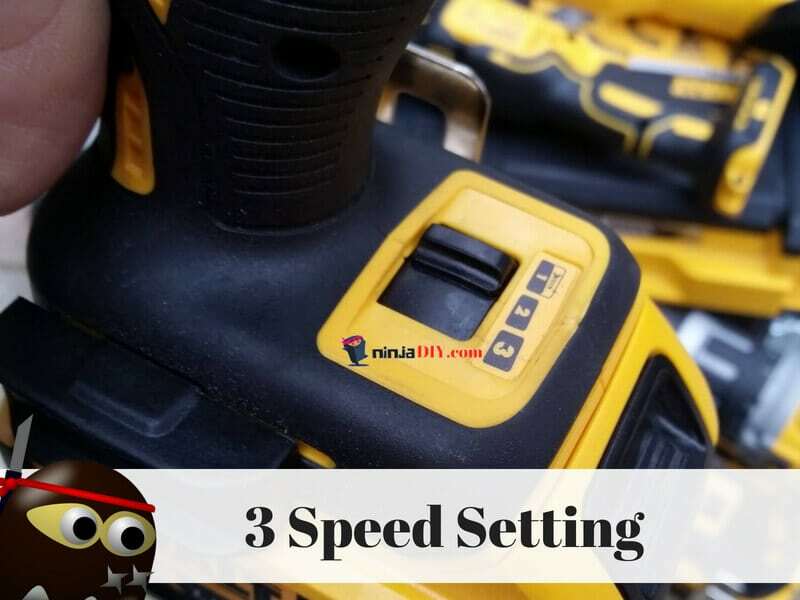 So, this impact driver will allow you to get on with your tasks without tiring and the fatigue you would normally experience using other tools. Honestly, the first time I’ve got my hands on this baby … I loved it. It’s very light and when I have it hanging on my belt, my day it’s better because I can rest assure that, it won’t matter the task at hand … I’ll be more than equipped with my DCF887 impact gun. You can always review the DeWalt DCF887 User Manual if you need more help or you want to find out more in-depth information about this impact driver. The DeWalt DCF887 is by all definitions a top pick for any DIY enthusiast or professional. Below is a roundup of areas where the manufacturer performed exceptionally well, and a few others they fell short on. 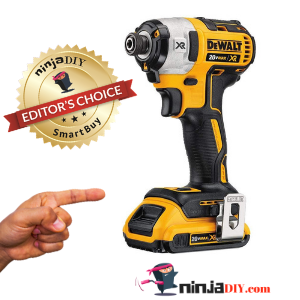 With a rating of 4.8 stars out of 5 on Amazon at the time that I’ve written this article (keep in mind that those ratings could change), you would be correct to assume that DeWalt spared no effort to make this impact driver the best in its class. So what features can you expect from this one of a kind cordless impact drill? Let’s take a look below. This impact driver is powered by a 20Volt Max XR Lithium-Ion (2.0ah) battery that delivers more run time and has a great capacity. The driver also comes with a spare battery ensuring once the first battery is drained, you don’t need to stop working to charge but instead pick up the spare battery and keep going. However, if you prefer battery packs with more capacity, DeWalt offers a 4.0 A.h option instead of the standard 2.0 A.h default option. The DeWalt DCF887 comes equipped with a 3-speed adjustable power setting that is helpful in situations where finesse is required over raw power. The speed settings allow for optimized application versatility with the ability to adjust the torque settings on the tool. The impact driver has three speed/torque settings, the 250 max torque setting, 1,500 max torque, and a powerful 1,825 max torque. The 250 max torque setting on the DCF887 is the lowest setting also called Precision Drive. The precision drive is perfect for situations where you need to be more careful about driving the screws in. The impact driver automatically slows down giving increased control when driving in screws. 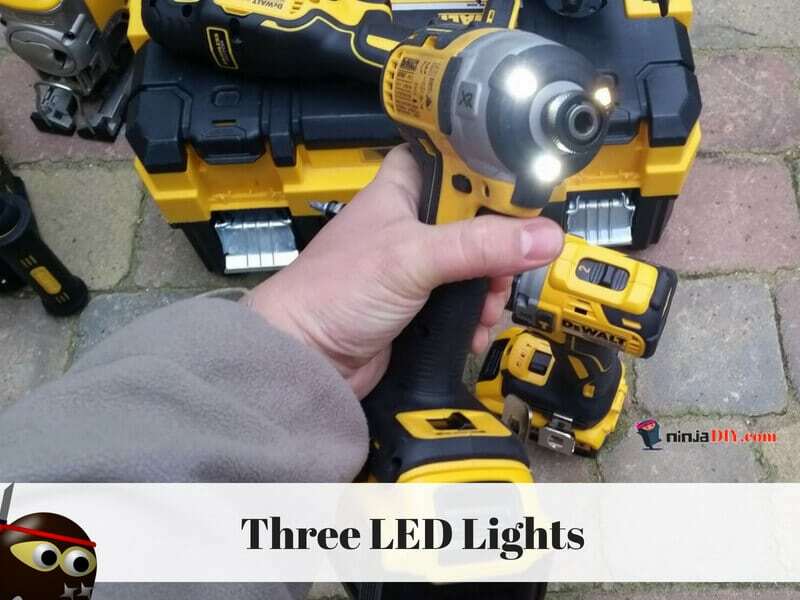 The DCF887 is equipped with three LED lights that illuminate your work area, providing the convenience and comfort you need while undertaking your various DIY tasks. This impact driver features a compact, lightweight design that makes it suitable for working in tight spaces. The handle is designed to give the user as much comfort as is possible while the tool itself is light enough to warrant a comfortable working experience. The handle has a well-crafted “pistol grip” that stays in your hand even in max torque setting. The DeWalt DCF887 runs on a brushless motor. What exactly does a brushless motor mean as far as the performance is concerned? It means that the impact driver is capable of running for a longer time on a single charge than a brushed motor. Not only will the DeWalt DCF887 run for a longer, it will also sound quieter and stay cooler, all on a single charge. The brushless motor used to power this impact driver is capable of putting out a massive 1825 inch-pounds of torque and is capable of reaching speeds of up to 3250rpm with a total of 3600 impacts-per-minute. All that is possible when you have the tool in high gear. In terms of physical dimensions, the DeWalt DCF887 is 5.3 inches by 8inches by 3inches. The impact driver weighs a total of 2 pounds which compared to other competing models is quite light. The DCF887 is packed with raw power that allows the user to easily drive screws through concrete or any hard material being used. The impact driver has a compact and lightweight design that makes it perfect for long projects that involve working in tight and confined spaces. The three LED lights used to illuminate the work area during use remain on for an extra 20 seconds after the trigger is released. This allows the user to inspect the quality of the work done. Despite the manufacturer’s best efforts to reduce the noise levels using a brushless motor, the DCF887 is quite noisy compared to other models in its class. The DeWalt DCF887 is also priced relatively higher than most competing models. Consumers seem to love the addition of three speed/power settings. A lot of DCF887 users feel that the three power settings are godsent especially to people who have trouble varying the power of similar tools manually via the trigger alone. For its price, the features and quality of build offered on this model make this impact driver a top pick. A lot of people don’t seem to mind the price as long as the impact driver performs well. According to my experience and findings, there have been reported cases of wobbly chucks and a section of DCF887 owners had had to take their tools in to get repaired. A lot of users aren’t happy about DeWalt’s choice of batteries. Competing brands offer batteries with significantly higher ampere-hour ratings. The 2.0A.h standard offered is a far cry from 5.0A.h batteries offered by competing brands such as Makita. … or even worse. Broke down and you don’t have a warranty anymore. Check out these guys website for parts for your DeWalt DCF887. Here’s a nice diagram of this impact drill. 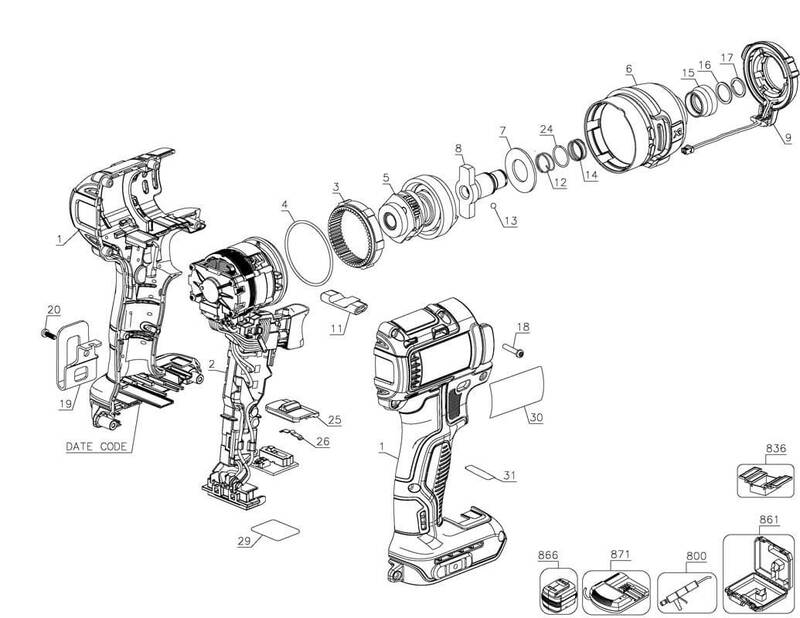 If you click on the image it will take you to another website where they’ll tell you what those numbered parts are called. There is not much to complain about in the DeWalt DCF887 screw gun. 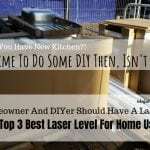 It is a top performer in its class and is among the best-selling power tools of its kind. You cannot go wrong with this superb impact driver. … even easier, go to Amazon and check out the DeWalt DCF887 for even more details like price or more pics. You’ll find hundreds of reviews by clicking on the above botton. What an awesome and detailed review. I enjoyed reading it. I am after a new tool and are a couple that I’m considering. 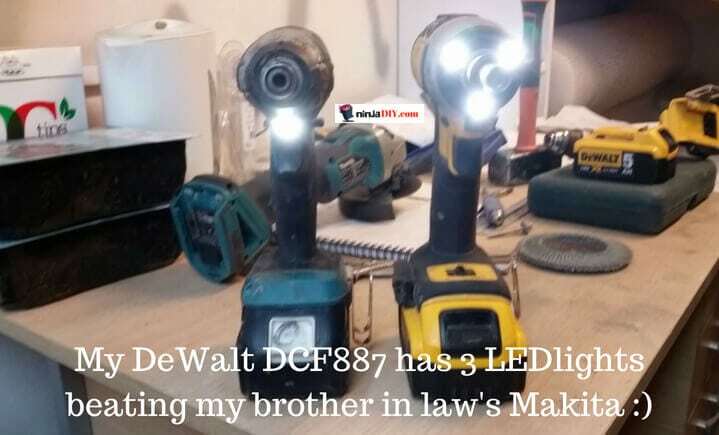 One is the Dewalt dcf887 that you talk about here and the other is the Makita xdt111. Been reading reviews for the last few days and yours is really well done. What do you think about or know about the Makita xdt111? Thanks for the nice words man 🙂 and I’m happy you enjoyed it. It’s one of those top brands, and to be honest, whatever you go for between the DeWalt DCF887 and the Makita XDT111 … you’ll be just fine. There are some small differences … but nothing major on my part. One thing though. Last I checked on Amazon, the DeWalt DCF887 was a bit cheaper than the Makita…so it’s up to you, depends on your budget as well. Thanks for stopping by. If you have any questions, leave it in the comments.